This is our second post for today. To see our Inky Paws Challenge Winners, scroll down or click here. Name the Bunny Week At Newton's Nook Designs! All week we will be featuring Bunny cards from our design team to get you excited for a NEW bunny set next week! PLUS - we are holding a poll to choose a name for the bunny character! Vote to help us name our Bunny for a chance to win! What should Newton's Nook Designs name their bunny character? This cute bunny has appeared on six different stamp sets - as a cheerleader, in a hula skirt, buried in snow and more! Now she needs a name! With the help of their design team and friends they've chosen some favorite names but now they need your help. Check out this poll and vote for your favorite name. Plus - two random winners will be chosen from all the votes to WIN the new 4 x 6 Hello Spring stamp set featuring the bunny! You can vote once a day - until Sunday, March 14th! Winners will be announced on Tuesday, March 15th with the reveal of the new Hello Spring stamp set! Head over to our poll to vote - enter here - and share with your friends too! Today we have bunny inspiration from Jess and Lydia! Jess created two fun cards using our Garden Whismy stamp set! I love how she used the same design on both, creating a fun background using the smaller leaf and flower from this set. Yet they look so different, just because of the colors she used! Super fun! 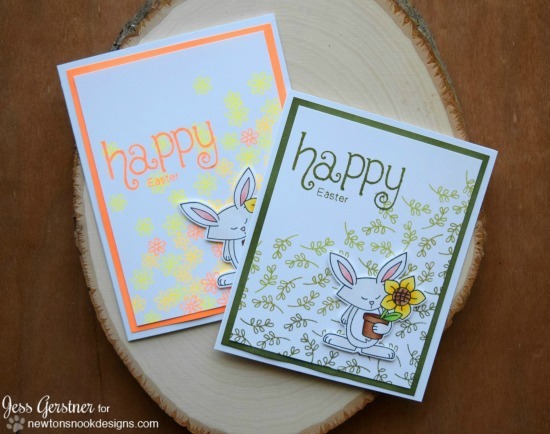 She also used our Simply Seasonal stamp set for the "Happy easter" sentiment. Lydia also used the bunny from our Garden Whismy stamp set. For her card, she stamped the bunny with white ink on kraft colored cardstock and colored her with colored pencils! Isn't this so pretty? I love the soft pastel effect this has! She added in the "plant smiles" sentiment, also from the from our Garden Whismy stamp set. Hope you enjoyed our bunny projects today! Don't forget to go and vote for your favorite name and a chance to win our new set next week! Such a sweet bunny - glad she's getting a name! Wonderful cards and great idea of voting the bunny's name! Personally I find that Lily is very cute one!!! Curious to see which name other people prefer! Adorable cards. I voted for Bonny. I thought Bonny Bunny had a nice ring to it! So appropriate for Easter!